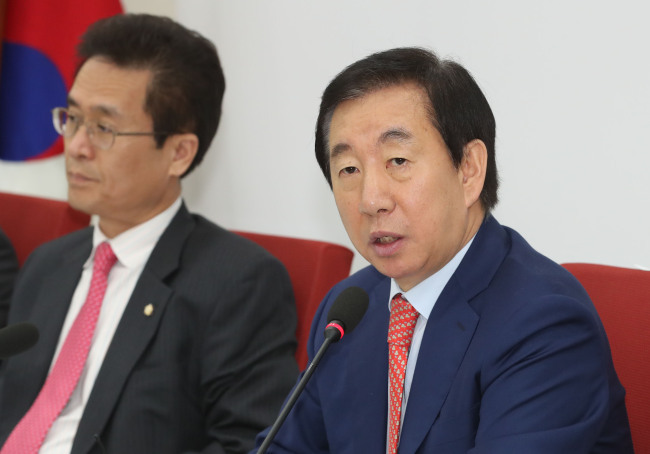 The main opposition Liberty Korea Party on Tuesday announced its proposal for a constitutional amendment that seeks to redistribute presidential powers, hinting at a difficult negotiating process with the ruling party. The conservative party also outlined its preferred timeline to bring to the table an amendment bill at the National Assembly in June and put it to a national referendum by September. The main opposition’s proposal calls for changing the current five-year single term presidency to a semipresidential system, under which the president would represent the country and manage external affairs, while the prime minister would take control of internal state affairs. The prime minister would be appointed by the National Assembly. “When the president appoints the prime minister, the role of the position is limited to aiding the president,” the floor leader of the Liberty Korea Party, Rep. Kim Sung-tae, said in the press meeting. The conservative party’s proposal also suggested giving the president the right to dissolve the National Assembly with approval from the prime minister, as a way for the state chief to keep the parliament in check. Regarding the government’s idea of changing the presidential system to a four-year term with the possibility of re-election, the opposition party said that would only reinforce the “imperial” power of the president. Although the current presidential system has often been accused for allowing the president to have too much power, it appears to be the most preferred form of government among citizens here, according to local polls. To curtail presidential power, the party also suggested limiting the president from appointing posts in entities such as the prosecution, police and National Intelligence Service. Instead, a special independent committee would recommend candidates to the parliament to decide. Tuesday’s announcement also included a plan to lower the voting age by a year to 18, but under the premise that the school grade system is restructured. However, the Liberty Korea Party’s proposal is expected to face backlash from the ruling Democratic Party of Korea, which supports the government’s proposed amendments. A clash between the two parties regarding the timeline for constitutional amendment is also inevitable, as the liberal ruling party and the government aim to put an amendment bill to a national referendum in tandem with local elections slated for June 13.